The black version of the phone can attract fingerprint smudges. Not to be outdone by the iPhone 6 Plus, Chinese vendor ZTE has come out with its own high-end phablet, the Nubia Z9 Max -- an aluminum smartphone with a feature-packed camera. I tested the device and found it impressive. 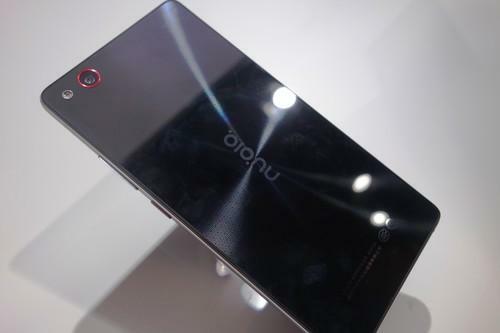 Chinese vendors are releasing more top-notch handsets, and ZTE's Nubia team has added to the trend with the Z9 Max. The glass covering didn't make the phone slippery, but fingerprint smudges are noticeable in the black version. The Z9 Max has a 5.5-inch 1080p screen and Qualcomm's new Snapdragon 810 processor, which has 8-cores and runs at 2.0 GHz. However, during Thursday's product unveiling, the Nubia team spent most of the time playing up its ability to capture vivid images. It has a rear 16-megapixel camera, and a front 8-megapixel camera, but a unique feature is the phone's set of 8 camera apps. I didn't have time to try all the photo apps, but it's nice to have so many options.